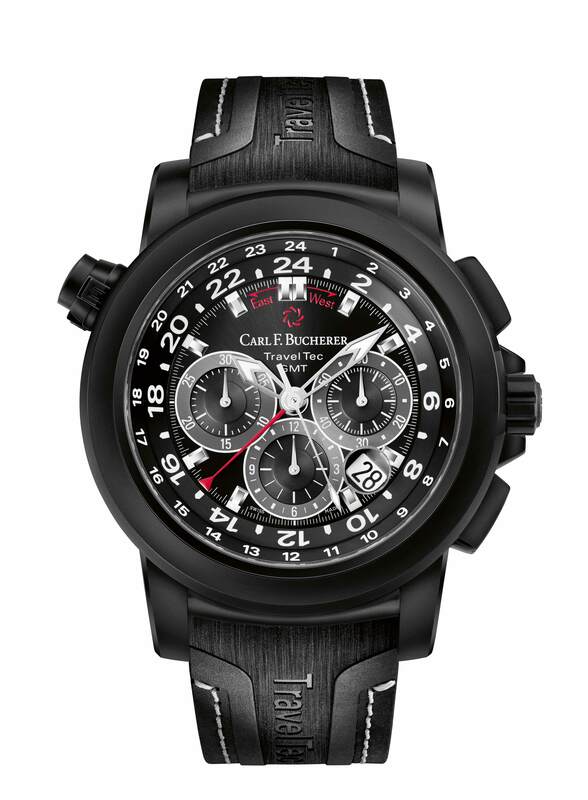 Matte-black and powerful, with an air of mystery, the Patravi TravelTec Black is more than a mere timepiece. Matte-black and powerful, with an air of mystery, the Patravi TravelTec Black is more than a mere timepiece. It not only displays three time zones simultaneously: wearing it is also a statement of clarity, vitality and self-assurance. With a nonreflecting, scratch-resistant and shockproof DLC finish, the Patravi TravelTec Black does not set out to dazzle. Nevertheless, it shines with its highlevel functionality, independence of character and many advanced technical features. The heart beating away in the steel case speaks an equally forceful and unmistakable language. And the chronometer-certified, CFB 1901.1 caliber stands for unmatched precision and reliability. The stark contrast between dial, hands, indices and scales guarantees high legibility even when visibility is poor and makes the Patravi TravelTec Black an ideal companion, whatever its owner turns his hand to and wherever life takes him.